MORES CREEK SUMMIT, IDAHO — What a difference a week can make. Last week, we went with water specialist Ron Abramovich to measure the snow at Mores Creek Summit, and the numbers were discouraging. The snow contained only 73 percent of the average water for February first. "It's one of the lowest we've had," said Abramovich. "About the seventh lowest since 1961 or so." Only once in the last decade has the snowpack gone back to average from such a deficit. Last week the lower elevation mountains around Mores creek were mostly bare. Today, the view is totally different and much more encouraging, thanks to the storms that dumped snow throughout Idaho. The mountains received anywhere from fifteen to thirty inches of new snow, and that includes the Mores Creek drainage. All of the water from that snow ends up here in Mores creek, from Mores creek it dumps into Lucky Peak reservoir and the Boise River system. From the Boise to the Snake, from the Snake to the Columbia and eventually to the Pacific Ocean. When snowpack is in short supply many think of the impact on farmers, but in our growing valley the water is becoming just as important if not more important to homeowners who use it to water lawns. But that's just the beginning of the water usage, from summer recreation in the reservoirs that store the water, to the floaters who spend hot summer days on the Boise River, to the high volume of water needed to push juvenile salmon and steelhead through eight dams on their migration to the ocean, and the power those dams generate. "And the list goes on," said Abramovich. "But there are many people in the west who rely on our snow and water." After the recent storms the Boise Basin is now at 85 percent of average. Most of south and central Idaho also saw a spike in numbers including the Weiser River Basin which went from 91 percent of average to more than 100 percent. 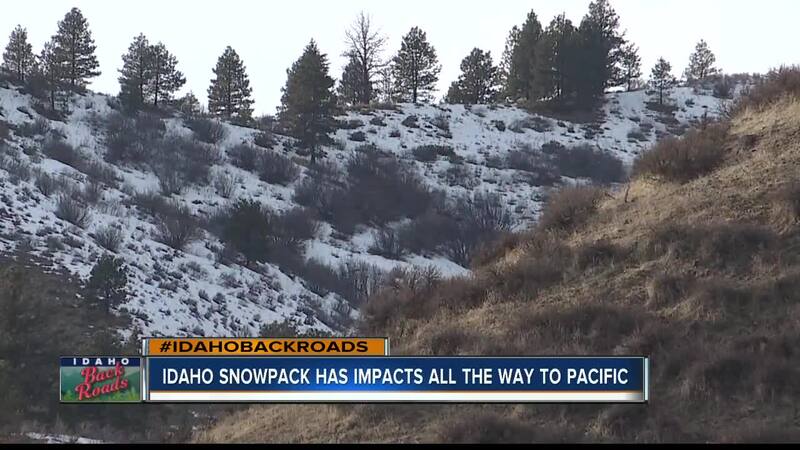 "So it has helped a lot, and it was concentrated mostly in central Idaho which were the lowest in January. They were around fifty percent of average," said Abramovich. Abramovich and many others who understand the importance of the snow and the water it will become are happy about the boost provided by mother nature, but they will continue looking to the sky and hoping more storms move in. "Now the storms are coming in and we just gotta get in the target zone of where the snow falls," said Abramovich.